1 drawing on paper : col. pencil ; image 10.75 x 6.75, on sheet 12 x 8.5 in. 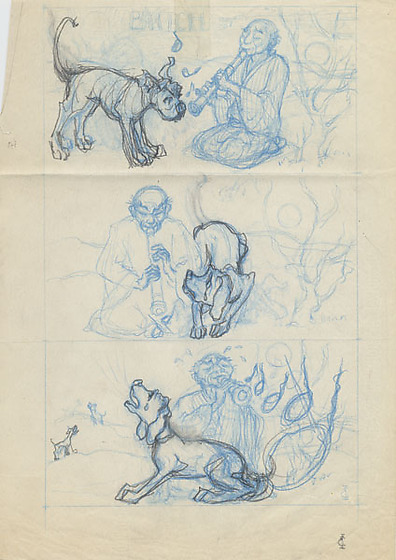 Pencil drawing of a three frame sequence of man playing flute while listening dog becomes sad and howls ; drawn in blue pencil with dog overdrawn in dark pencil. Top frame: a balding man in a kimono sits with eyes closed playing a flute next to a barren tree under the sun, right, as a dog stands on the left, facing right, listening with nose to base of flute ; three music notes visible ; lettering above "B [unreadable] TCH." Second frame in middle: man faces forward playing flute directly in front of him, left ; tree and sun on right ; dog crouches down, between man and tree, looking up at him with a tear on cheek. Bottom frame, man sits in center, lifting flute in air as he plays with sweat jumping off his brow ; five musical notes grow larger as it leaves the flute moving toward the viewer, overshadowing tree and sun ; dog crouches before man in profile left, lifting his head to howl ; two dogs visible in distance howl on hills. Main dog and second dog are drawn over with dark pencil ; man and musical notes are drawn dark in first and third frames ; man's face and hands are emphasized in second frame. Written in pencil, bottom right corner: E [overlapped by] I.